The Designer Series ThermalHEART™ Bi-fold doors are thermally broken to deliver exceptional thermal performance. Doors and windows incorporate a reliable bottom mounted roller system for smooth, reliable, performance. Our heavy duty quad rollers run on a matching double track for optimum performance and support this ensures heavy panels operate easily. Series 730 incorporates Thermal HEART™ technology giving a true wide thermal break between the outside and inside faces. WERS (Window Energy Rating System) data shows that using the same IGU in a Thermal HEART™ awning is 32% more efficient than a standard non-thermally broken window. A major advantage with Thermal HEART™ in cold climates is the reduction in internal condensation. Thermal HEART™ is also suitable for hot climates. We offer Thermal HEART™ in a range of stocked colours including dual colour ClearMIST™ . Running bi-fold doors on bottom rollers reduces the problems caused by lintel sag and allows us to offer optional highlights. This bi-fold door has been tested for compliance with the relevant Australian Standards and achieved a high water resistance of 380Pa, this makes the product suitable for most residential applications. Low air infiltration suitable for air conditioned buildings. The extra strong door stiles allow over size door panels to be fabricated. 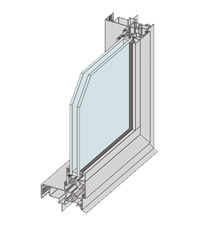 Sharp square external glazing beads are standard. 100mm frame and transom have a soft 2mm internal radius. Doors can be fitted with a variety of custom lever and bi-fold activator sets (ICON™ or MIRO™ ) with Lever Compression Lock (LCL) motor as standard. ICON™ lever sets are available in 316 Stainless steel finish.